Last night George, the other half and I were invited round to my sister's house, which luckily is only about 5 minutes down the road from us. My sister is Cabin Crew with British Airways and speaks fluent Japanese. We found out last night that she cooks fluent Japanese too. "I had for the first time cooking making Japan dishes for more my sister like a chef tonight. His turtle woman really are seems to be excited. Oh, what should I do"
Apparently this had something to do with one word half meaning something else, as my sister valiantly tried to explain, but I was too busy giggling to listen. Anyway, here's what she cooked, which was (for the record) delicious. "You make it by dipping the chicken in raw egg and then Panko breadcrumbs, and deep frying for about 5 minutes on each side - the oil has to be on a medium heat so it goes golden-brown but doesn't burn. 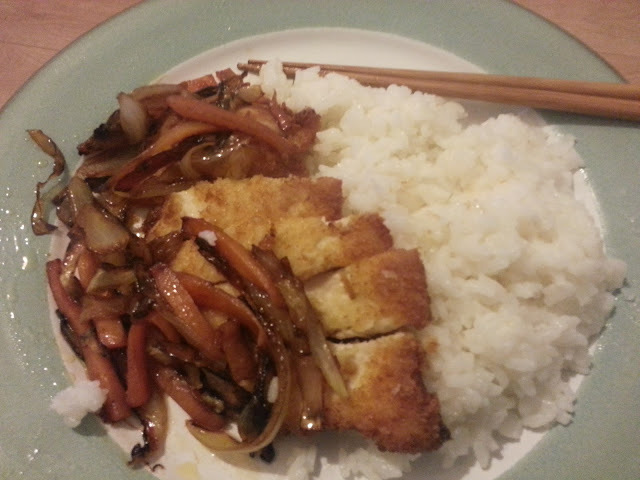 The rice was just standard Japanese rice and the vegetables [onions and carrots] were literally just fried in veg oil and loads of soy sauce. That's all it was." Easy, huh? Well, apparently so - but as you can only get Panko breadcrumbs from a special shop in central London maybe not so much. However, I reckon it would work with gram flour mixed with a little bit of ground ginger for a similar effect - the Panko breadcrumbs made the chicken lovely and light and crispy. You can get Japanese rice and gram flour from big supermarkets. George says it was just the ticket. Thanks, Anna! Okay,so that's a meal sorted when she next comes to stay with us, then.